Let’s face it: In the great state of Texas, the common hog is never going to rival the majestic steer for supremacy when it comes time to build fires and smoke meats. Our abundance of cattle and vast ranges of open fields means that cows, bulls and steers will always be the first choice of pit bosses across the Lone Star state. But that doesn’t mean that we have to neglect the noble pig. 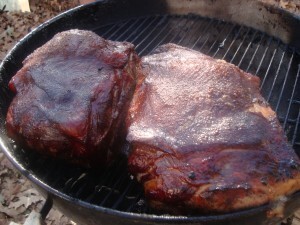 Pictured: A pair of hickory smoked pork shoulders from my barbecue photo archive. I always give these a nice brine before smoldering them over a hickory fire in the backyard for 10 or so hours. Pork is a forgiving protein, you have a lot more leeway as far as misgauging the precise moment the meat should make its way off the fire and onto the cutting block. This entry was posted in Texas Barbecue, Texas Barbecue Photos and tagged Austin, barbecue, BBQ, best barbecue, Brisket, central Texas hot guts, Pork Ribs, texas. Bookmark the permalink.